I use a planner and am a big fan of lists that I put on giant post its in the planner. I use a cute little journal as a planner. Most of everything on my list is “Do it ASAP or within a few days” kinda thing, so I don’t miss having a calender. And then I like to cross off each item as I finish. Maybe I should look into scheduling my life better too! I love this. Right now I have a covey planner I use and have started putting work, school and personal commitments down on paper but I might start writing out time blocks. I like having my days planned during the week and if need be, the weekend to stay on task with things. Google calendar is seriously the best. It does all of that stuff for you. I have separate calendars for personal, work, birthdays… and I access it from my iphone. You should seriously look into it! i am a self-report planner extraordinaire and my favorite tool to use is a moleskine 18-month planner. one side of the page has the week divided into days and the other side of the page has empty lines so you can write extra notes. 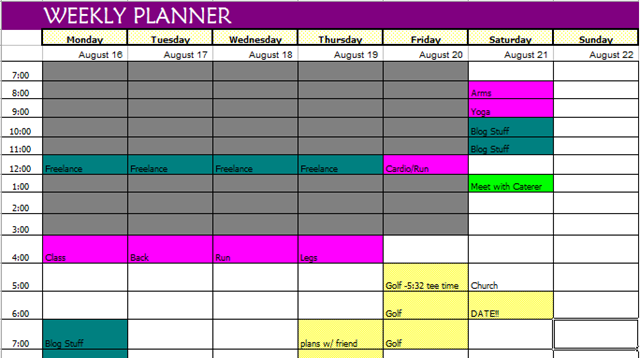 i keep my weekly plans, weekly to-do list and my “checkbook balancing” all in one place! i LOVE it!